Fried eggs sounds like one simple recipe, but it is not the case to me. When everytime I cook the fried eggs, the egg never got the desirable shape that I wanted it to be. So it's no that easy at all. 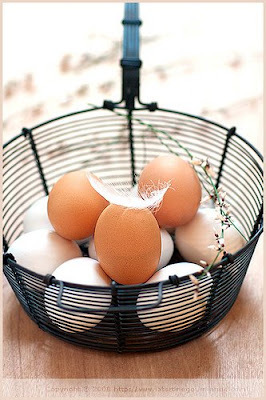 In fact, I find the fried eggs the most tasty among all the eggs recipe, (I mean only use eggs in the dish). Add a little onion, I would be perfect. I think I have found the reason why I always encounter failure. It just that I was not using a flat pan, but rather using the tipical chinese pan. My dad, he was also using the pan just like me, but he got good skills, which is never going to comanded by me andyway after so many failure. I wish someday I could make a great looking fried eggs that with the very tender inner side.